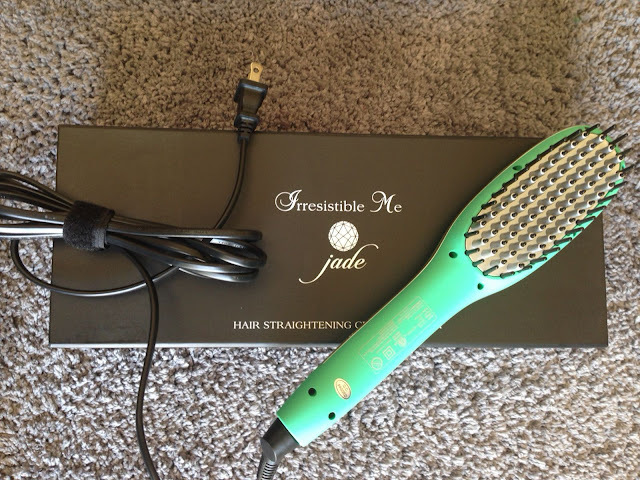 I herd everyone talking about these Irresistible Me Jade Hair Straightening Brush and i got the opportunity to try it, which I find quite great. Firstly what i was impressed by was the packaging, you don’t normally get hair tools in such a wonderful packaging and for that I was impressed, its a box that’s sturdy and can be used for even other things other than using it to store the straightening brush. 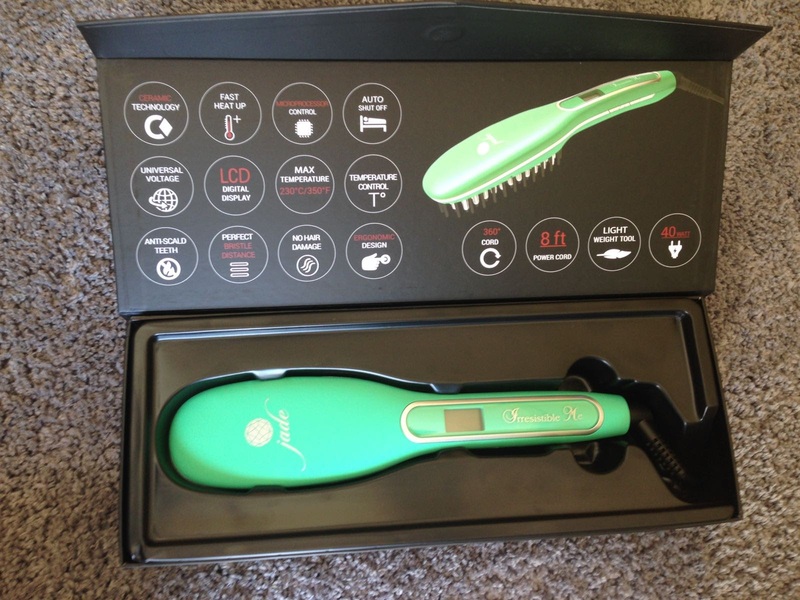 The quality of the brush is also great and I am in love with the colour of the brush, it heats up quickly within seconds which is another plus it ranges from 270 degrees – 470 degrees F. Its anti scald and anti static for virtually no hair damage. It also has auto shut down which is wonderful because sometimes it can be that your straightening your hair and you remembered to do something and you forget to shut off the iron which can cause problems so the auto shut off is a great feature. This is a wonderful product for the price, you cant pass up a deal like this. 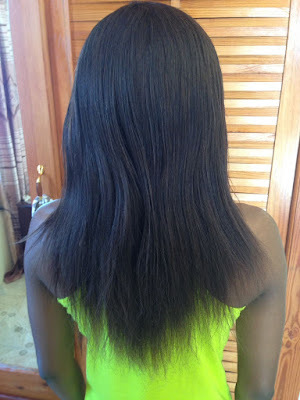 In my opinion it straightened the hair really well you have to go over it more than twice than you would with a normal flat iron where you just go over the hair twice and your good to go with this straightening brush you have to have more patients. It doesn’t straighten the ends for me as well as a flat iron but it gets the job done, one thing i think could be different is the debt of the brush could be more so it could grip the hair more that’s just my opinion other than that i love this brush, Here I will show you the results of my before and after. So that’s my before and after guys, I do recommend this brush to anyone especially those who are on the go and just need a quick run through with their hair in the mornings and also handy to travel with, it would be even greater if they had a mini version to it which would be more light weight. 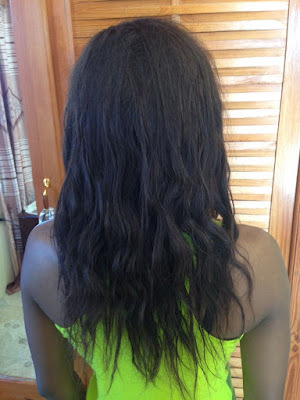 IrresistibleMe doesn’t also has other various products to try guys, chek them out they have other amazing products that i hear is amazing and also have seen reviews about that i myself want to try. Have you ever herd of Irresistible Me? Have you ever tried any of their products? Did you know that they also sell hair extensions, for those who love hair extensions do check them out guys and its quite affordable.